MTRI is a recognized leader in the research, development and practical application of sensor and information technology to solve critical problems in national security, protecting and evaluating critical infrastructure, bio informatics, earth sciences and environmental processes. The Institute works to establish the pairing of new phenomenological (cause-effect) understandings and the development of mathematical paradigms to extract new knowledge from existing and non-traditional data sources that lets the responsible party make better decisions in the real world. It is the combination of the phenomenological model, and an understanding of the sensing mechanism that pervades the approaches being developed to more accurately and completely reflect the state of the system(s) under observation and the strength of the conclusions reached on the system's purpose and intent (future state). 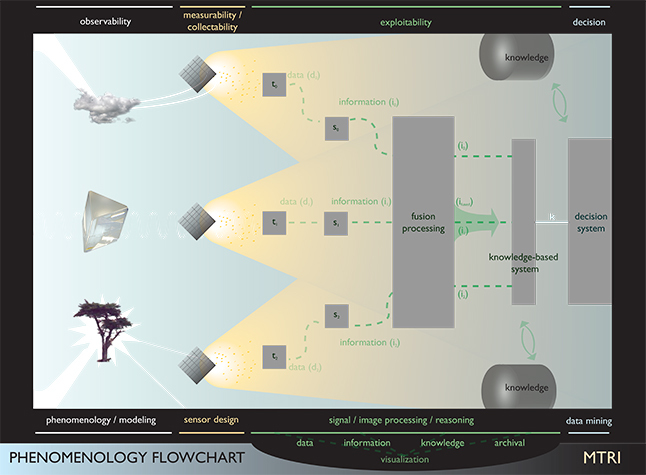 The process illustrated above captures the intimate connection between the data, information, knowledge and actions to be taken as a result of the observations/measurements. Taking into account this interaction provides unique insights into the processing approaches that are developed to support the customer's needs. This paradigm is at the crux of the activities within MTRI.